Clarifiers work on the principle of gravity settling. 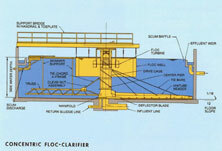 The heavier suspended solids settle in the clarifier due to the quiescent conditions provided in the Clarification zone. The settled solids are swept to the centre well provided for collection of sludge with help of moving scraper blades. Many a times the natural settling is enhanced by addition of coagulant & polyelectrolyte. The coagulant neutralizes the charges & agglomerates the suspended solids to form micro-floc. The polyelectrolyte brings together these micro-flocs binding them with long chains to make heavy floc which easily settles down. Most of the waste waters contain some scum material which does not settle down & needs to be collected on the surface of the clarifier. Hence a scum removal arrangement is normally provided. A simple clarifier is depicted in sketch below. To facilitate the dosing of Chemicals as well as to ensure proper flocculation, many clarifiers are equipped with either separate flocculator or some clarifiers have a flocculating zone also. There are many design variation among the above type but available space & flow dictates whether it will be a circular or rectangular clarifier. The Clarifier design can be applied to water or wastewater treatment systems. It includes a larger influent well to provide the required flocculation time. Mixing is also added to achieve economical flocculation. 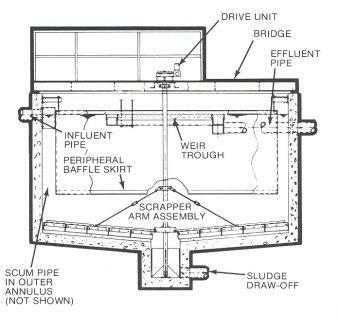 Designed to exacting specifications, the Clarifier is shop fabricated for bolted assembly, comprises of a reinforced influent well and features cast iron drive housings, deep scraper blades, adjustable squeegees and full surface adjustable skimmers. Mechanical flocculation is proved by either concentric ‘stacked’ drives or independent mixers. Tanks start at ten feet in diameter and larger. Circular sludge collectors are available in either full or half bridge designs. The Chain & Scraper Sludge Collection System provides maximum sludge concentrations and scum/floating solid removal regardless of the size or application. Rectangular clarification, a separation process commonly used in very large or space constrained municipal and industrial spaces, removes both settled and suspended solids from liquids. Suitable for primary, secondary, storm water collection and water plant service, Chain & Scraper is a high-quality option for both new and existing rectangular clarifier installations. To operate, flights mounted on two parallel strands of metallic or non-metallic chain scrape the settled solids along the tank floor to sludge hoppers. On the return run, the flights can skim the surface and concentrate the floating material at a scum removal device. Both three and two shaft designs are available if skimming is not a necessary function. To assist the gravity settling many innovations are made in clarifier design. A very popular design has Inclined plates (Lamella Clarifier) in the clarifying zone for rapid settling of flocs. The plates are placed at an angle (of 55-65º) & the water travels upwards. The solids (flocs) due to inherent weight cannot travel with same velocity & tend to settle on the plates provided. The slope of the plates ensures that the solids slide down to the collection chamber. A schematic of Lamella is depicted below. Another design involves creating slow turbulence in the settled sludge itself. The upward moving sludge helps to bring down the settleable flocs faster to sludge zone. Clarifiers find application in almost all water & waste water plants depends on the influent SS and turbidity. The major applications would be as below.